My everloving did not forward ASFR 3 (saying that it would give we a swelled head) so I had to wait until I got home to find out what it was all about. Anyway, enclosed herewith is a little updating in re the Rim Worlds series. 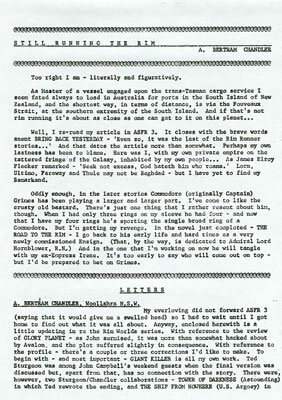 With reference to the review of GLORY PLANET - as John surmised, it was more than somewhat hacked about by Avalon and the plot suffered slightly in consequence. With reference to the profile - there's a couple or three corrections I'd like to make. To begin with - and most important - GIANT KILLER is all my own work. Ted Sturgeon was among John Campbell's weekend guests when the final version was discussed but, apart from that, has no connection with the story. There were, however, two Sturgeon/Chandler collaborations - TOWER OF DARKNESS (Astounding) in which Ted rewrote the ending, and THE SHIP FROM NOWHERE (U.S. Argosy) in which Ted's main task was to write out all references to the wicked Russians. In each case I was in mid-Pacific when the rehashing was urgently required, otherwise I'd have been able to do the job myself. GIANT KILLER, as a matter of fact, was anthologised. It appeared in WORLD OF WONDER - Twayne Publishers, New York, 1951 edited by Fletcher Pratt, in which quite a number of today's science fictioneers rubbed shoulders with Rudyard Kipling, Franz Kafka and O. Henry. To conclude, both Susan and myself are impressed by ASFR - and not just because of the kind things said about me. It is a most professional job.